A new paper on the subject is out, by Rachel Reid et al. I’m not going to describe or comment much on it right now because (a) the paper is ungated, (b) the results are not terribly surprising, and (c) I’ve covered a lot about consumers’ response to health plan quality previously. Suffice it to say, there is a statistically significant and positive correlation between Medicare Advantage plan quality (star) ratings and enrollment. Not unrelated, there’s money on the table. Obviously I’m glad it isn’t the other way around! 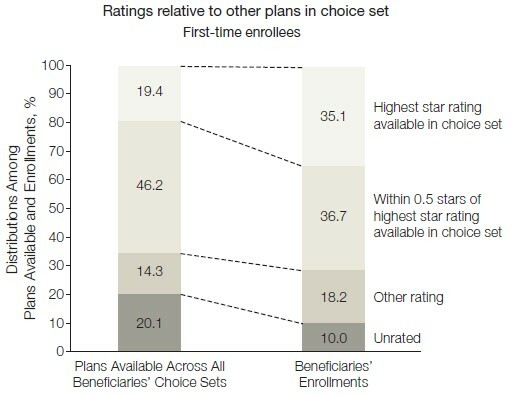 However, does anyone know how reliable the 5 star rating is – for example, are beneficiaries’ health outcomes noticeably better in high-rated plans? Does the star rating adequately adjust for health status? Is average healthcare spending lower in higher-rated plans? It would be interesting to know how this compares to other (less rigorous) quality ratings, like the customer star ratings on Amazon. Do random consumers on Amazon have more power than a detailed government evaluation of health plans? Anyone know?